One of the main reasons I like to run is to shed the stress of work. But if you’re different and want to keep on working right through your workout, check out the StepDesk. 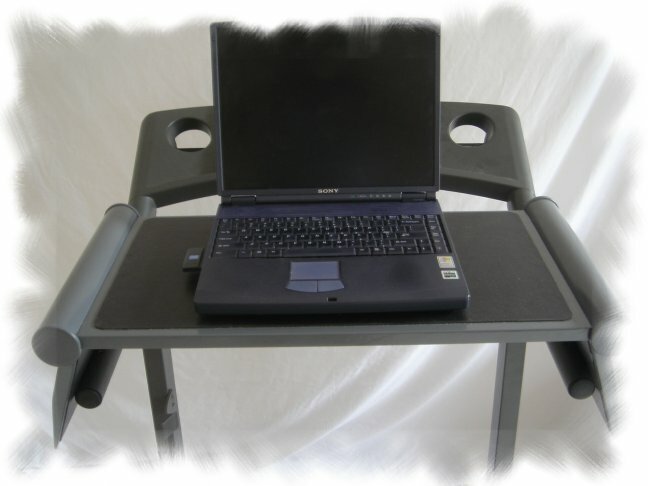 Keep in mind you can only go 2 miles per hour (about 200 calories per hour) when using the StepDesk. For me this is conducive to NOT sweating and potentially compounds boredom with stress. They have a whole ‘team’ working on this patent-pending brainchild that securely grips to a treadmill’s rails using adjustable arms. From the pictures it looks like the StepDesk is going to block any view of the treadmill’s display, so it’s probably time to get off when you’ve passed-out from boredom and hear the thump/bump of your face bouncing on the belt, shaving away your face like a nice Dill Havarti. There’s a survey that suggests this may cost between $30-$70. Certainly more money than duct tape, a plank and an old mouse pad, but the StepDesk can be folded and taken with you (don’t feel bad, they have a team).